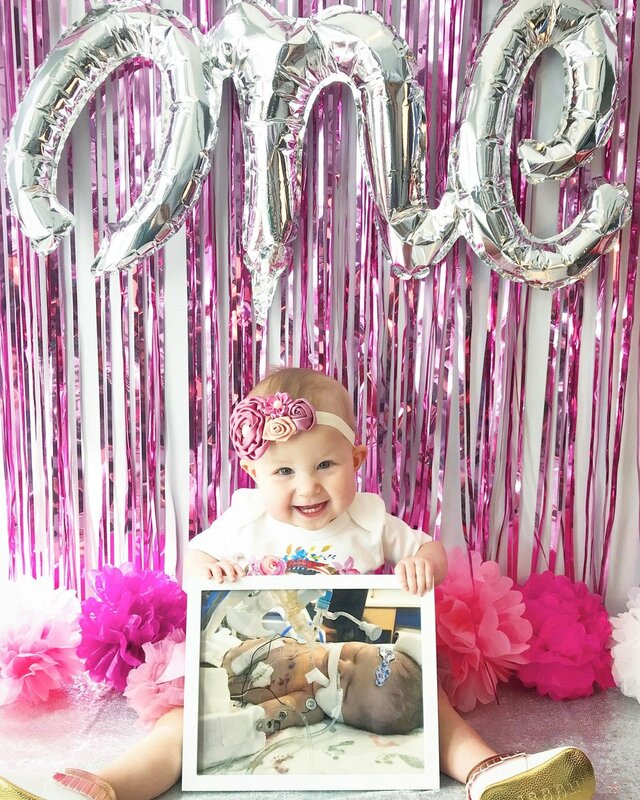 Scarlett’s CDH story began on October 27, 2017 at her 18-week scan when we learned that she was diagnosed with a severe left-sided Congenital Diaphragmatic Hernia, with her heart displaced to the right side of her chest. She would later also receive a diagnosis for a heart defect known as a hypoplastic aortic arch with mitral valve stenosis. After receiving the CDH diagnosis, we were advised to consider termination, so we left the appointment with little hope or direction. What started as a joyous day ended in devastation and confusion. After connecting with fellow CDH parents in an online support group, we chose to relocate to Johns Hopkins All Children’s Hospital in St. Petersburg, Florida from Ohio to receive care from Dr. Kays and his CDH team. During consultation, he predicted that even with a severe case and a suspected heart defect, she’d have a 90-95% chance of survival under his care (significantly higher than the odds given to us at home). Scarlett was born in March 2018, leading us on a journey even more challenging than we expected. During repair surgery we learned that she had only 20% lung volume with 30% liver, stomach, spleen, and bowel in her chest. She underwent the repair while on ECMO, where she remained for 14 days. The remainder of our 99-day inpatient stay came with additional unexpected challenges, but unbeknownst to us, the biggest challenges would be faced after discharge. Upon returning home, we learned that Scarlett would require open-heart surgery to reconstruct her aortic arch. She underwent circulatory arrest on cardiopulmonary bypass and her arch was doubled in width with donor tissue. Surgery was a success, and we were on the road to recovery. 6 weeks later, we returned to JHACH for follow up, and we were disappointed to learn that Scarlett had a recurrent diaphragmatic hernia. Her kidney had migrated into her chest through an opening in her diaphragm. This was a result of challenges we faced during a previous operation. We canceled our flights home and remained in Florida for hernia repair. After a successful surgery, we returned home to Ohio again. 12 weeks after returning home, Scarlett experienced acute symptoms related to a bowel obstruction. She was rushed to the hospital, and then transported to another hospital three hours from our home. The following day she was taken into emergency surgery to repair the obstruction. This was our fourth hospitalization (and second unexpected hospitalization in three months), so we were depleted of resources between time away from work, unexpected travel, and mounting medical expenses. We were unable to get into the Ronald McDonald House due to a lengthy waitlist, so friends and members of the CDH community pulled together for us. Sensigreen mailed us a care package, which included a gift card for a night’s stay at a local hotel. This support was so impactful to us, not only because it provided us with a resource that we needed, but because we could feel the love and support from afar. Organizations like Sensigreen CDH Foundation provide families with a supportive community and with access to factual information to assist them in making treatment decisions. It is through these connections that families can learn about expert physicians. It also a space to meet others who are walking the same journey. And when the journey is feeling particularly dark and scary, like ours was during unexpected hospitalizations, receiving support in a variety of capacities (whether it be financial, emotional, or otherwise), is deeply impactful. We realized that despite those dark days, we have never felt alone. Scarlett’s story is long and filled with challenge, but I want to emphasize that it is a positive story of HOPE! With expert care, she has come through each of these challenges stronger than before. We are living out the experiences we were thought were stripped away from us on diagnosis day. We’ve learned that this diagnosis can be conquered and that you can still find joy and happiness. If you are facing a CDH diagnosis, please hold onto this hope and know that you are not alone.